The ocean at the beach of Samara Beach is usually calm. The bay of Samara Beach is a popular vacation destination among Ticos and tourists. Because of an offshore reef Samara Beach is one of the safest beaches, not only on the Nicoya Peninsula but in all of Costa Rica. 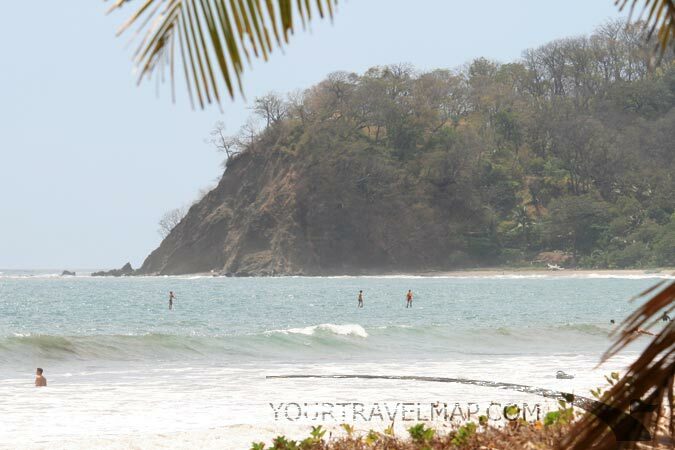 That is why Samara Beach is an appropriate destination for a Costa Rican family vacation. The island Chora is situated at the mouth of the deep bay and is a favored destination for kayak and snorkeling trips. The 3 kilometer long beach in the bay is shaded by palm trees and during some hours of the day it is too hot to rest in the sun. Surf classes are offered in Samara Beach and the waves are excellent for beginners, but too small for the serious surfers. The people at the local surf school can tell you where good surf spots nearby are located. Stand-Up Paddleboarding in Samara Beach. 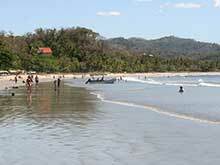 Many of the villas and vacation homes in Samara Beach are owned by affluent Costa Ricans. The former President of Costa Rica, Oscar Arias, as well owns a vacation home in Samara. In 1987 he was honored for his peace plan for Central America with the Nobel Peace Prize. The document can be seen in the National Museum in San Jose. In the sleepy village of Samara Beach, which is located in the center of the bayshore, you will find restaurants, souvenir shops and tour operators. Most of the visitors prefer to sit in one of the lovely cafes or restaurants directly on the beach with a beautiful view of the bay. Pelicans, Toucans, Parrots and Iguanas populate the surrounding area. Especially during the winter months Grey and Humpback Whales frequent the waters off Samara Beach. During that time you can see their huge fins and blows from the beach. 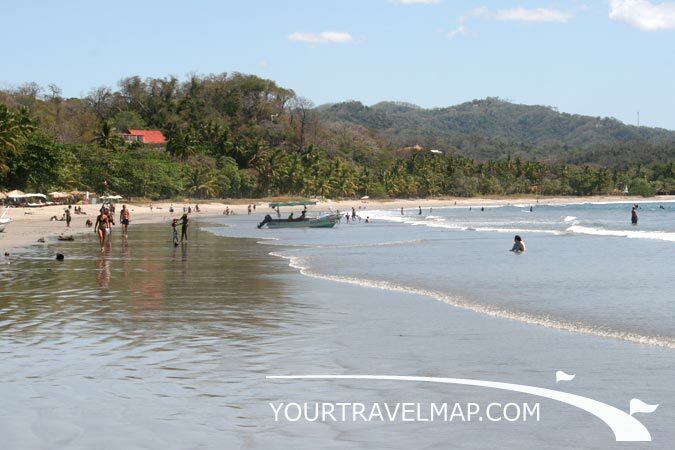 Samara Beach is located in the province of Guanacaste. 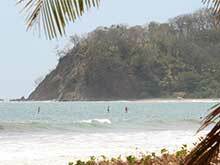 Samara Beach is one of the safest beaches in Costa Rica. Distance from San Jose to Samara Beach: 239 kilometers respectively 148.6 miles. Travel time from San Jose to Samara Beach: 4.44 hours. Distance from Liberia to Samara Beach: 112.3 kilometers respectively 69.8 miles. Travel time from Liberia to Samara Beach: 2.18 hours. Samara Beach is easy accessible by car, the whole trip from San Jose or Liberia to Samara Beach you can drive on paved roads. There is a small airport situated 4 kilometers south of town. Inland flights to Samara Beach are offered from several locations in Costa Rica, for example San Jose and Liberia.